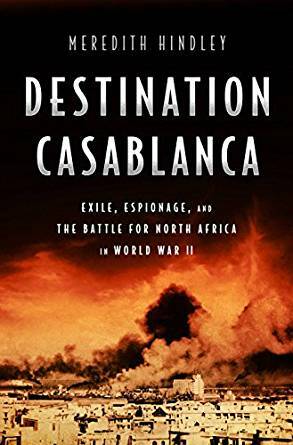 The real-life drama of the refugees, resistance fighters and Allied spies who flowed through Casablanca in the build-up to Operation Torch in November 1942, when some 33,000 American soldiers stormed the beaches of French Morocco. ...[a] compulsively readable, deeply engrossing new history ... Even military officials and politicians take on a certain dramatic character arc in Hindley’s rendering. Pétain emerges as a kind of cult figure among the masses ... For those readers, like myself, who have watched Casablanca more than a few times, it’s hard not to see certain affinities between the stories that Hindley chronicles here—much more than mere backstory, widening the lens and introducing a cast of historical players who never even made it into the story meetings in Burbank—and the film made three quarters of a century ago ... Confection or no confection, the charmed classic made in Hollywood’s dream factories and the granular history recounted in Hindley’s superb book fundamentally complement each other, entertaining and instructing us with their timeless tales of political intrigue, moral compromise, acts of courage and cowardice. The sagas of individual refugees unfold throughout the book, putting a human face on the drama, but Hindley frequently shifts her focus to the global events taking shape in France, Britain and the United States, underscoring Casablanca’s strategic importance on the world stage ... Hindley is particularly adept at illuminating the tense inner workings of Vichy France, the unoccupied Free Zone under Marshal Philippe Pétain, and the elaborate power struggles that played out between high-ranking collaborators and French loyalists ... With its lively storytelling and impressive scholarship, Destination Casablanca succeeds as a thorough and highly engaging chronicle of the French Moroccan theater of war. Casablanca was indeed a hotbed of intrigue. But it would be a mistake to confuse Ms. Hindley’s book with the film. What she has produced is a detailed account of the war years in Morocco, the country’s feuds between pro- and anti-Vichy officials, its diplomatic deals and stand-offs, and the setbacks and successes of the Allied landings. This is a book for historians, not film buffs ... Ms. Hindley is good at evoking these adventurers, schemers and idealists ... Digging deep into military archives in Britain, France and the U.S., Ms. Hindley has produced a scholarly narrative, weaving her way deftly among a large cast of characters, both familiar and unfamiliar. What did you think of Destination Casablanca?